ECP Steel Piers and specialized tools have been designed and engineered to perform. The products are manufactured in a state of the art, high tech facility using mill certified materials and welded by certified welders. ECP Steel Piers have been tested and proven in all soil types to provide stability and performance. Each ECP Steel Pier is individually load tested on site to insure a higher load capacity than required to support the structure. This Factor of Safety insures that the settlement problems are over and the likelihood of returns for "adjustments" is highly unlikely. All installing contractors have been trained and approved to install ECP Steel Piers. Skilled technicians perform the installation, testing and restoration operations. No large equipment is necessary to install the ECP Steel Pier so there is minimal impact on the lawn and shrubs. 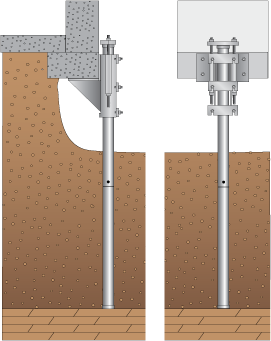 ECP Steel Piers are specifically designed to eliminate as much skin friction as possible, thus "down drag" from consolidating soil is not a problem and does not affect the pier. ECP Steel Piers have been installed to depths exceeding 120 feet to a verified suitable bearing stratum. Installers document the project by recording the installation force on the pier, the depths to verified bearing and the final pier working loads after restoration. ECP training dictates that an even and gentle restoration process be used to lift the structure. Large groups of piers, or all of the piers, are gently loaded simultaneously; thus insuring the minimum amount of stress is applied to the structure during restoration. No soil need be stacked and hauled from the site. The small excavations required to install the ECP Steel Pier are filled with the removed soil. No waiting a week for concrete to cure. Once all ECP Steel Piers have been installed, restoration begins immediately. Most projects are finished in a few days.